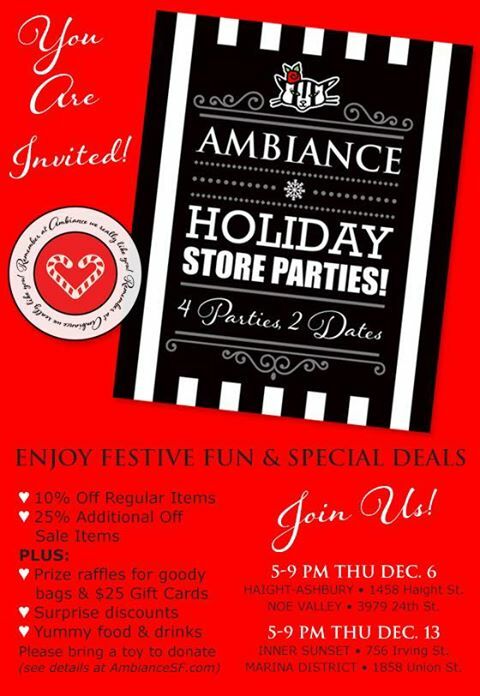 Stop by Ambiance during their Annual Holiday Parties featuring delicious Holiday treats, prize raffles for goody bags and $25 Gift cards, free gift with purchase over $50, 10% off regular price and 25% additional off sale merchandise. In 2018, Haight-Ashbury & Noe Valley are hosting their parties on December 6 from 5 pm to 9 pm while the Inner Sunset & Marina District branch will be on December 13, 2018 same time. You are also encouraged to bring a toy to donate.